Just so you know, I’m currently sobbing into my phone writing this blog post because I’ve been back from our little sunny holiday over a week, the memories are fading as fast as my tan, and writing this will only serve to remind me it’s going to be at least a year until our next family jaunt overseas. But, needs must, and I will be strong and selfless and finish this post. It will take a lot of gin. It’s ok I brought a decent supply back from good old duty free (wink wink). 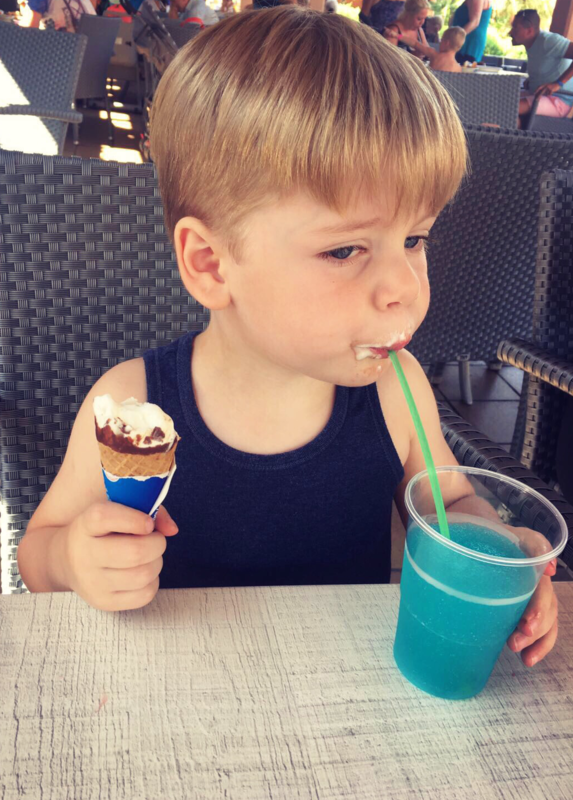 So l thought I’d do a quick round up of my holiday memories for you, and maybe you’ll pick up some tips for surviving a family package holiday abroad. You know, because holidays with young kids are NOTHING like the holidays you’ve been on before – the childless holidays of your mid-twenties or early thirties. Contrary to popular belief, the flight’s actually the relatively easy part, once you get past the death stares from the couple in the seats directly in front of you, as they realise you’ve got two small children (make a judgement call as to whether you’re gonna stop or ‘gently encourage’ toddler to frequently kick the back of their seats by how much you like the look of them). If you haven’t got one already, invest in a Kindle Fire (Kids Edition, obvs), stick on Boss Baby and you’re done for the entire flight. BOOM. Its when you get to the hotel that the real fun starts right!? So first I think it’s important to point out that I mention the word ‘tan’ above, but I actually look more like I’ve been rubbed lightly with a soggy tea bag. In addition, don’t make the mistake of getting a cute inflatable boat and sticking your kids in it for a quick photo opportunity. Then I made the mistake of taking an ACTUAL BOOK on holiday. Pages, words, everything! It was especially ‘novel’ to my toddler having never seen me read a book before that wasn’t by Julia Donaldson and Axel Scheffler. Make sure if you put it down, you memorize whatever page you’re on ‘cos toddlers haven’t quite grasped the purpose of bookmarks. Actually just go ahead and read the ending before you start, because you’re not going to finish it, and even if you do you’re likely to get to the last page and find it smeared in ice cream, or that your baby has eaten it. No you’ll take it in turns to go up and get food for the kids (first, pancakes and chocolate sauce every day for breakfast, of course) then one of you supervises the kids whilst the other gets theirs. Then you’ve taken so long waiting for the nice little man to cook your omelette you’re greeted with hangry stares from your other half as you return to the table. They’re covered in half chewed food and by now the kids are already finished and ready for pool and ice cream (yes at 8am!) and you haven’t even taken a mouthful. Fear not, the pool bar is about to open so you can just fill up on icy alcoholic drinks instead. Lunchtime, and you can forget even trying to get the kids to have anything that slightly resembles a healthy meal, and certainly nothing green! Take my advice and put an ice cream in one hand and a plate of chips down in front of them and let them go to town. Order yourself another drink. You deserve it. Dinner ain’t going to be a drawn out romantic affair either. Forget three courses, unless you can fit everything on one plate. Get your other half to do a ‘reccy whilst filling the kids plates with chicken nuggets and then you can target the good stuff straight away. Trust me you wanna be in and out. By now the kids are bat sh*t cranky and on a major sugar comedown and already pulling you towards the door because they can hear the reps starting to sing the hotel song from the entertainment stage. And honestly you’re going to want to substitute food for alcohol to survive yet another night of stumbling awkwardly around the mini disco with your two year old whose just staring gormlessly at the painted on cheesy smiles from the entertainers on stage. After hours – I had visions of me and hubby sitting out on our terrace at night drinking cocktails until the small hours whilst the children sleep. And yes, I can guarantee you the kids will be knockout at night. Ha, but so will you. Next thing you’re fast asleep, snoring, dribbling, fully clothed with remnants of the late night ham and cheese toasties stuck in your beard (yes Mr S, I’m looking at you). And then it’s a few hours sleep before kiddos are awake at the crack of dawn despite not going to bed until WAY after their usual bedtime and the thickest of black out blinds in the room. Ok, Ok I’m gonna hold my hands up, I was under no illusions that a family holiday with two young kids would be relaxing. I wasn’t intending on being able to finish my book, really. And I don’t ever go ‘Out Out’ any more so there’s really not much point in needing the time to perfect my tan. What I did experience however was a fun-filled week of smiles. The kids had such a great time. Toddler learnt to doggy paddle (and canon ball). Baby learnt what proper sand tastes like. Mum and Dad learnt the fine balance of how many poolside drinks you can manage whilst still looking mostly responsible for your offspring. And my posh duty free bottles of gin will sit in my drinks cabinet as a happy reminder of our holiday memories. Even though they’re all already empty. Do not fear for my gin-sanity though as they will, of course, be re-filled on a weekly basis with the supermarkets own brand finest.